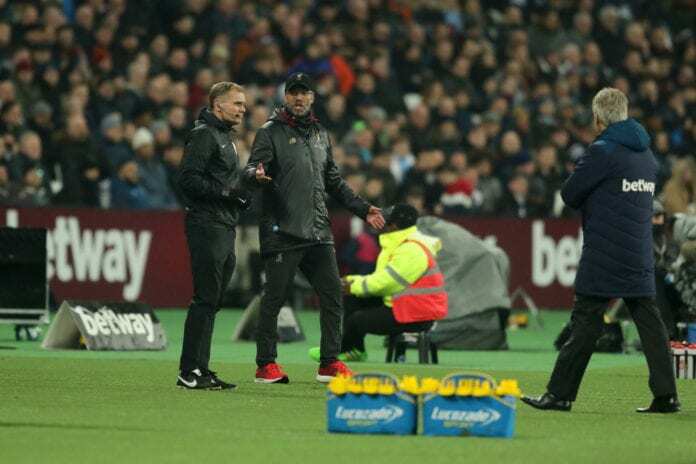 Jurgen Klopp and Manuel Pellegrini have both bemoaned the poor decisions of the match officials during Liverpool’s 1-1 Premier League draw at West Ham. The Reds opening goal converted by Sadio Mane should not have stood as James Milner was adjudged offside in the build-up. Michail Antonio equalised for the Hammers but Origi would have wrapped up the winner late in the game and was wrongly ignored once again. And Klopp intimated he felt Friend attempted to right the wrong of his assistant’s earlier decision to allow Mane’s goal to stand by giving decisions against the Reds. “It was a tough game. You saw around the set-piece, we knew about the routine but when we trained we had three other players in the team,” Klopp told BBC Sport. “Apparently our goal was offside and maybe the referee knew that in the second half. It’s a point and it’s a fair point. “Probably all the reports are already written without me saying anything, I didn’t see anything about the pressure that you can ask in the next few questions. Asked to further explain his confrontation with the officials, Klopp told Sky Sports: “I was really calm. He [Friend] said we don’t talk at all. Pellegrini was also critical of refereeing decisions during the game, feeling West Ham could have taken all three points. “We had a lot of chances to win this game. We drew because they scored a clearly offside goal,” Pellegrini said to BBC Sport. “The last play of the game, Origi missed that goal. He was offside. It was a big mistake from the linesman. “Playing against a team who have scored so many goals with the best defence in the league, I’m happy with the performance but disappointed with the result.